Weekly Update from Your Alderman: North Clark St. Community Visioning, Swedish American Museum Expansion, Chicago Filmmakers, Weekend Events, Whole Foods Supports Hayt Elementary School, and more! Earlier this week I announced that my office, in partnership with 40th Ward Ald. O’Connor, Edgewater Chamber of Commerce, and Edgewater Development Corporation, is engaging in a community visioning process for North Clark Street, between Ridge and Devon avenues. This week we held a roundtable breakfast for business owners along this stretch to brainstorm ideas for bringing more vibrancy and new businesses to the street. Please mark your calendar for a series of community conversations next month: Friday, Oct. 7, 5:30-7:30pm; Saturday, Oct. 14, 2-5pm; and Sunday, Oct. 22, noon-3pm. I will share more details on these events in the coming weeks. I encourage you to take a walk along this part of Clark St. and support the local businesses here, as well as envision what kinds of businesses and infrastructure improvements you’d like to see. Three businesses recently opened at Thome and Clark: TK Photography (6241 N. Clark St.), a family photo studio; Heirloom Books (6239 N. Clark St.), a used book store; and K&J Global Pharmacy(6237 N. Clark St.). Please join me in showing them a warm welcome to our community. A little further south on Clark St., the Swedish American Museum (5211 N. Clark St.) announced earlier this week that they purchased their neighboring building as part of a plan to expand the museum. On the heels of the installation of the Swedish flag water tower during the summer, this is exciting news for our community. Congratulations to Executive Director Karin Abercrombie and her team on a productive summer. The Swedish American Museum is an important anchor institution in the Andersonville district and a great community partner. Please visit their museum, which includes an engaging and interactive area for children, and gift shop to congratulate them on their coming expansion. This week’s Chicago Reader features a great article about Chicago Filmmakers and their coming relocation to the firehouse at 5720 N. Ridge. Chicago Filmmakers has been an important cultural institution in our community and in the city of Chicago, and I am very excited to cut the ribbon when they move their operations to the firehouse. I will keep you posted as the date for the grand opening is confirmed. Osterman Beach Clean-up: Join Senn High School students, Alliance for the Great Lakes, and Ocean Conservancy for a beach clean-up from 9am to noon on Saturday, Sept. 16. Click here for details. NewStory Fall Kick-off Party: As we say goodbye to summer and welcome fall, come out for a big picnic/potluck complete with fun, games, music (and even a bounce house)! Come on out Sunday, Sept. 17, noon to 3pm, and bring some food to share if you can! Click here for details. Edgewater Historical Society Home Tour: Take advantage of a rare opportunity of getting to see inside some of Edgewater’s oldest homes this Sunday, Sept. 17, as part of the Edgewater Historical Society’s annual Home Tour. Click here for details. On Wednesday, September 20, Whole Foods Market Edgewater (6009 N. Broadway) will donate 5% of all sales to Hayt Elementary School (1518 W. Granville). Please make an effort to support Hayt on this day by picking up a few groceries, buying a cup of coffee, or stopping by the salad bar for lunch or dinner. Last week, students at Senn High School lost a friend and classmate with the unfortunate passing of sophomore Meghan Dunne. My thoughts are with Meghan’s friends and family during this difficult time. Click here for information on how you can support her family. Have a great weekend. Click here to view an email I sent out earlier this week listing more than 20 events in the community through the end of October. The Department of Water Management plans to install approximately 2,002 feet of 8-inch water main on Kenmore between Bryn Mawr and Berwyn. As part of this project, the east half of Kenmore will be resurfaced along with the repair of damaged parkway and sidewalk. Water main installation is anticipated to begin in late September 2017 with completion in early December 2017. Once the water main is installed, the street will be restored so that traffic is not impacted. However, final restoration is weather dependent and may not occur until the spring of 2018 or until weather permits. Our office will share details on a community meeting to review plans and expected community impact for this project in the coming week. The 48th Ward office, in partnership with Uptown United and Chicago Department of Transporation (CDOT), is coordinating volunteers to assist with data collection to measure the impact of the new Argyle Streetscape. We are looking for volunteers to conduct pedestrian counts on Argyle between Sheridan and Broadway from 11:30am-1:30pm and 5-7pm on Tuesday, Oct. 3; Thursday, Oct. 5; and Saturday, Oct. 7. Volunteers must be able to stay on their feet for two hours. There will be a mandatory training on Thursday, September 28, 4pm. If you are interested in volunteering, click here for more information and to sign up. Please contact ally@48thward.org with questions. Free flu shots will be provided by the Chicago Department of Public Health for anyone 6 months of age or older, at the 48th Ward office, 5533 N. Broadway, on Tuesday, Sept. 26. 10am to 2pm. If you have a Medicare card, please bring it. No appointment necessary. Join us for the annual Edgewater 5K Run/1mi Walk, the only race course that includes Sheridan Road and the lakefront path! The Edgewater 5K raises money for all schools in the 48th Ward, both private and public. Your investment in today’s students is an investment in the future, as many of the 48th Ward graduates stay in the community. Since the race began in 2014, we have raised $15,000 for 48th Ward schools. Register to run or walk! All event details can be found here! The A.C.T. Group, along with CJ Jensen of Ameriprise Financial Services, will host the 4th ANNUAL SHRED EVENT to benefit Care for Real. Each year the results have increased and in 2016 our generous community donated $1290 in cash and 600 pounds of food to Care for Real and had 1500 pounds of shred! We hope to make 2017 an even better year!! Please join us on Saturday, Sept. 23 from 9:00–Noon in front of The A.C.T. Group’s office at 6228 N. Broadway. And please remember to bring your shred, a cash (or check) donation and/or non-perishable food (EXPIRED FOODS WILL NOT BE ACCEPTED). Join us for the first annual SENNTOBERFEST — a fall festival to benefit Senn High School! The event will begin at the new Senn Park Playground at Elmdale and Greenview with the official dedication, followed by a Halloween costume parade along Greenview to the festival! Suggested donation of $5/person or $20/family. All proceeds benefit Friends of Senn, the fundraising chapter for the school.Thank you to our partners at Andersonville Chamber of Commerce, Senn Park Advisory Council, Chicago Park District for making this event possible! 1) Like and follow them at facebook.com/playcedar. 2) Click here to complete a short survey to help be a part of Cedar Park’s future in Edgewater! Please join your neighbors in the new year to collaborate on improving community public safety issues and new initiatives. To learn more about CAPS (Chicago Alternative Policing Strategy), click here. Beat 2433 meetings are held at 7 p.m. the fourth Tuesday of every month. The meeting location will alternate between the Edgewater Library, 6000 N. Broadway, and Engine 70 Fire House, 6030 N. Clark. Click here to download a schedule. Reminder that Kimberly Foxx, the Cook County State’s Attorney now has a satellite office open at 4956 N. Sheridan, at the corner of Sheridan and Argyle. Stop by on the 1st and 3rd Fridays of each month with any questions or concerns from 10am-12pm. On Sunday, September 17, the Edgewater Historical Society will present its 29th Home Tour in the Edgewater Triangle neighborhood which includes the area within borders Bryn Mawr, Clark, and Ridge. This area of Edgewater includes many of Edgewater’s oldest homes built between 1890 and 1920. The tour will begin at Edgewater Baptist Church a Glenwood and Hollywood at noon. Tour goers will guide themselves to the open homes using the tour map. The cost is $25 per person and requires walking several blocks. No reservations are required. The architecture of the area includes older single family homes built in the Chicago Cottage style, Queen Anne homes with full front porches, Classic Chicago Two flats with custom design elements and some condo conversions of unique spaces in 6 flat buildings. There is something for everyone here. Kitchens have been redesigned, bathrooms have been updated, original woodwork has been preserved and thoughtful restorations have enhanced the historical character of the neighborhood. The Edgewater Historical Society (EHS) is seeking nominees for its Edgewater Living Treasures Award. The EHS invites Edgewater residents to submit the name(s) of anyone whom they feel is deserving of the award by October 1, 2017. A nomination form is attached. They can also be picked up at the Edgewater Historical Society as well as accessed on line at the Historical Society’s website. (edgewaterhistory.org) Winners of the award are at the sole discretion of the Edgewater Historical Society. The Edgewater Living Treasures Award will honor those individuals who have made significant contributions to the community by enhancing the quality of life of its citizens. An Edgewater Living Treasure is a person who makes an outstanding contribution to Edgewater, someone who is an example of community action helping neighbors to accomplish worthwhile goals. These are people we admire for their dedication to real change, and their determination to have positive ideas turn into reality. Nomination forms can be submitted by one or more individuals. 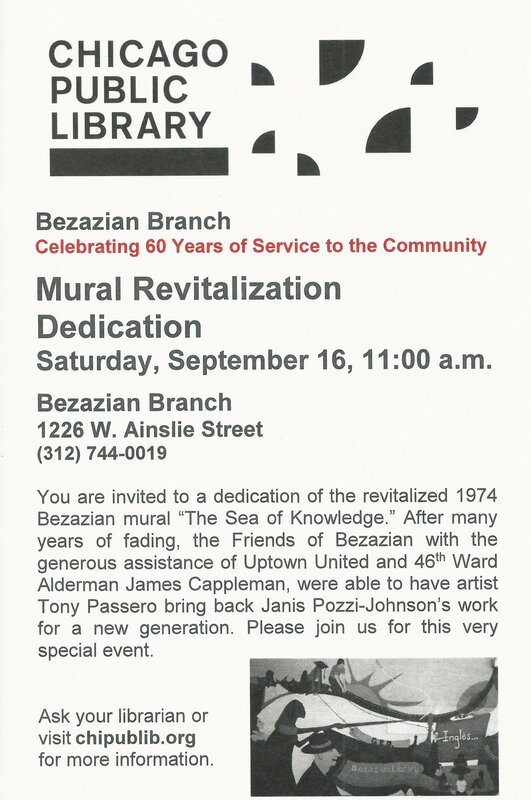 Continuing a year-long celebration of our 60 years of service to the Uptown community, Bezazian Library invites you to a very special event on Saturday, September 16 at 11 a.m. After decades of deterioration, we were finally able to have our 1974 mural revitalized. Archival research shows that it is the first on a Chicago Public Library building. Artist Tony Passero lovingly matched paint, deciphered images and recreated lost parts of the mural which was originally created by artist Janis Pozzi-Johnson with a team of teens from a local community organization. Ms. Pozzi-Johnson will be on hand for the rededication. The mural, entitled The Sea of Knowledge, celebrates the rich diversity that is Uptown. This project was made possible through the generous support of Uptown United (SSA #34) and 46th Ward Alderman James Cappleman’s office and the efforts of the Friends of Bezazian. Please join us in celebrating the renewal of an iconic piece of Uptown art that will be enjoyed again for, hopefully another 40+ years. Concurrent with the dedication is a Friends booksale. Come browse, support their great work, and join the Friends of Bezazian. The Edgewater Singers, a choral ensemble performing for more than thirty years in their community is seeking voices. If you love singing, have sung and want to raise your voice with like-minded singers, please consider auditioning. We need all ranges, especially tenor, baritone and bass and the ability to read music is desirable. For more information about Edgewater Village, click here. Be sure to check out the Edgewater Village Facebook page! Click here to view the Edgewater Village calendar of Events. Click here for a September events at the Edgewater Satellite Senior Center at the Broadway Armory. Click here for the 2017 calendar of events at the Edgewater Satellite Senior Center at the Broadway Armory. Shedd Aquarium extend a special welcome to guests 65 and better during Senior Days at Shedd, Tuesdays and Wednesdays in September. Arrive between 9 a.m. and 2 p.m. to receive complimentary admission to the Shedd Aquarium. With a printed schedule of the day’s events, explore all of Shedd’s exhibits, including Waters of the World, Caribbean Reef,Amazon Rising, Wild Reef, the Abbott Oceanarium, the Amphibians special exhibit and Stingray Touch experience. Admission to the aquatic presentation, featuring marine mammals and more, is included, as available. Senior guests arriving between 9 a.m. and Noon receive a $10 voucher good at all Shedd food outlets (while supplies last). Seniors arriving on their own receive complimentary admission for themselves plus one accompanying adult partner. Group leaders arriving with a reserved senior group also receive complimentary admission. Additional activities scheduled include garden tours, aquarium history/architecture tours and animal encounters in various exhibits. Individuals may obtain their passes on site only. Groups of 15 or more seniors require advanced reservations, available by completing the Senior Days group request form here. Will you walk with us? Join us as we walk to advance Alzheimer’s research and care in this year’s Walk to End Alzheimer’s. You can sign up on our page or register in person at any CMSS front desk. You can invite your family and friends. We are hosting a kick-off breakfast at Wesley Place at 8 a.m. Transportation will be provided to the walk at 8:45 a.m. Please let us know if you will be on the bus. If you choose to meet us at Montrose Harbor, we will have a table on site. Mas Alla Del Sol (5848 N. Broadway) will donate 10% of sales on Friday, September 22 to support Swift. Bring a friend for delicious Mexican food! George B. Swift Specialty School (5900 N. Winthrop Ave.) is a Level 1+ Fine and Performing Arts Magnet Cluster school, serving grades preK-8. With a population that represents over 50 countries and over 65 home languages, Swift is a true neighborhood gem. Click here for details. Please join Friends of Peirce at their Back to School Fall Festival on Saturday, September 23, from 1-4 pm at St. Gregory’s Gymnasium (1609 W. Gregory), All donations support the school. The 2017-18 school year is off to a great start at Northside Catholic Academy. NCA is pleased to introduce its new NCA President Rev. Tirso Villaverde and Middle School Assistant Principal Emily Carlson. Fr. Tirso joined the NCA community as Pastor of St. Margaret Mary in 2016. Emily has been with NCA as its 7th Grade ELA teacher since 2013, and also served as NCA’s Part-Time Middle School Assistant Principal during the 2014-2015 school year. She is presently working on her Master’s in Administration and Supervision at Loyola University.Both Fr. Tirso and Emily look forward to continue to strengthen and grow NCA, and provide a quality Catholic education to the parishes and neighborhoods of Chicago’s Northside. (Photo Caption) Introducing NCA’s 2017-18 administrative team: Principal Christine Huzenis, new NCA President Rev. Tirso Villaverde, new Middle School Assistant Principal Emily Carlson, and Primary Campus Assistant Principal Barb Karczewski. Northside Catholic Academy is now accepting applications for the 2018-19 school year. Applications are available online. NCA offers half-day and full-day preschool starting at age three, and a top-ranked K-8 academic program. Discover what makes NCA a Blue Ribbon School at the first Open House Coffee and Tour on October 4, at 9am, at the Primary School Campus (6216 N. Glenwood Ave.). Call 773-743-6277 to RSVP or to learn more. Chicago Early Learning is a citywide, collaborative effort to bring high quality early learning programs more readily to families in need throughout the city. We have reduced barriers for high-needs families to apply online to Chicago Public Schools and community-based preschool for their three and four year-olds at chicagoearlylearning.org. The Inspired Youth Tutoring Program needs volunteers to help 1st-4th and 5th-8th graders with homework and extra reading, writing, and arithmetic which the program provides. Volunteers are needed Mon. 6:30-7:50pm, Wed. 3:30-5:00 pm, and Thurs.3:30-5:00 pm. The location is Bezazian Library, 1226 W. Ainslie, 1 block south of the Argyle el-stop, just west of the Car Wash. Contact Beth Palmer, inspiredyouth2@gmail.com, 773-561-4759. Admissions Coffees feature informal conversation with current parents, presentations from the Head of Schools and other key administrators, and student-led tours. Reservations are strongly encouraged. 773-681-8436 or admissions@shschicago.org. Sacred Heart is located at 6250 N. Sheridan Road in Chicago’s Edgewater neighborhood. Sacred Heart is a Catholic independent school serving children in Kindergarten through 8th grade. Granville Avenue between Broadway and Sheridan Rd. An extended “Young Artists” showcase to celebrate the importance of arts education in our schools: Artwork by students of Hayt, McCutcheon, Northside Catholic Academy, Peirce, Rickover Naval Academy, Sacred Heart, Senn, Swift, and Chicago Jewish Day School. Performances by Goudy Rock Band and Peirce Bollywood Dancers. Parents and Teachers, do you have or know of a young person who loves to sing, dance or play an instrument? We have a fun opportunity for 48th Ward elementary school age musicians, singers and dancers to perform on stage at the Edgewater Arts Festival, on Sunday September 24. If your child or music student loves to perform and has a couple of songs they’d like to share with their neighbors, please sign up now for one of the limited remaining spots in the 5th Annual Children’s Music Talent Showcase. It’s not a contest, it’s a fun and friendly way of highlighting some of our talented neighborhood kids and it’s hosted again by Edgewater’s own professional musician Steven Solomon, who’s been performing professionally for 17 years, since age ten. 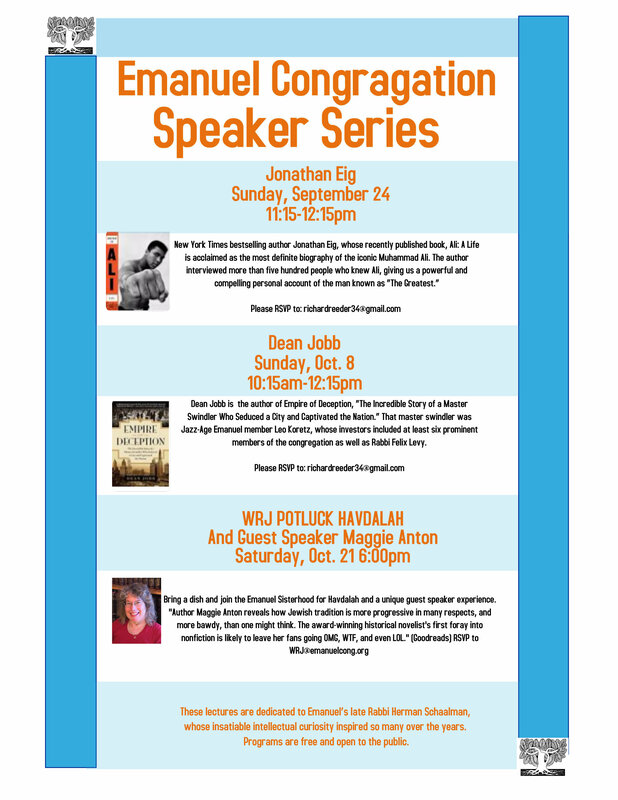 On Sunday, October 8, Dean Jobb, the author of Empire of Deception, speaks at 10:15 am. The book is subtitled “The Incredible Story of a Master Swindler Who Seduced a City and Captivated the Nation.” That master swindler, back in Chicago’s Jazz Age, was Congregation Emanuel member, Leo Koretz, whose investors included at least six prominent Emanuel members as well as congregational Rabbi Felix Levy. From September 5 through October 14, the Friends of the Edgewater Library will be accepting book donations. We rely on your donations to stock our semi-annual book sales. Proceeds of our sales directly support the Edgewater branch library. You can bring your donations to the library at 6000 N. Broadway. Local author Roger Prosise will discuss his book, Housing Projects, Mansions, and Schools: An Educator’s Odyssey, which is a luminously written memoir that shows how a boy moved from living in the worst public housing project in the country, Cabrini-Green in Chicago, to becoming the superintendent of a school in one of the wealthiest communities in the country, Bannockburn School. The presentation will cover Medicare enrollment, the four basic chapters (A, B, C, & D) and how Medicare works for you. What will transit oriented development (TOD) mean for Edgewater? With the CTA’s Red Line running through it, Edgewater is primed to be a key front in this rapidly evolving area. Join us for a lively discussion on the pros and cons of TOD, Edgewater’s past development patterns, and what the neighborhood can expect in the years ahead. Come to open chess play during which players can teach and learn new skills. Join other writers in the Edgewater community in an exchange of feedback and support in your writing endeavors. Held in conjunction with the Community Writing Project, we will have an experienced facilitator on hand to guide the discussion. Join us for a lively discussion of Jessica Jones, Alias: Volume 1 by Brian Michael Bendis. Copies are available for checkout at the circulation desk. Monthly meeting of the Friends of the Edgewater Library. The Friends enhance the materials, programming, and services of the Edgewater branch of the Chicago Public Library. The No Book Club is for people who enjoy reading and talking about the books they’ve read. 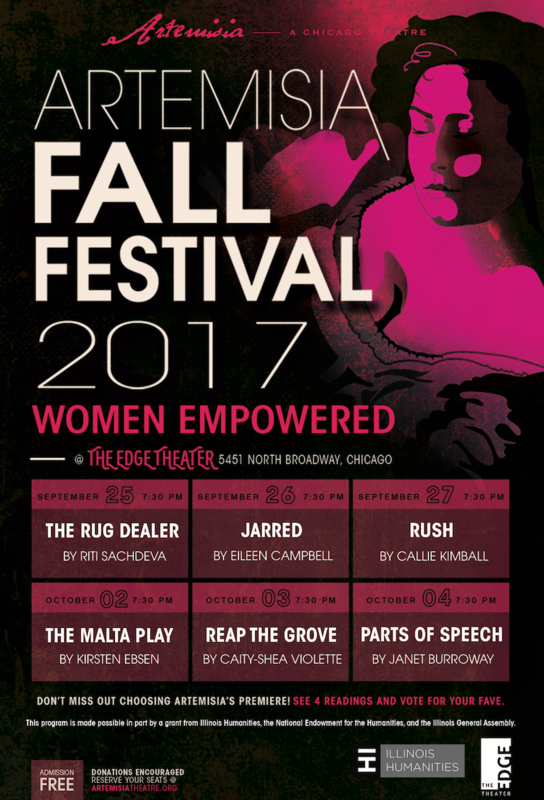 Sponsored by the Friends of the Edgewater Library, Edgewater Village, and Edgewater Reads. Do you live east of Clark between Devon and Thorndale? Join your neighbors from the 24th District to exchange information about neighborhood conditions, identify crime, and discuss disorder issues. Together we will develop strategies to improve the community. For the month of September, Care for Real is bringing back our 30 kids in 30 days campaign- and setting our fundraising goal of $33,000 to help ensure we feed 30 kids, 3 nutritious meals a day, for one year. Let’s come together and make sure no child has to worry about where their next meal comes from. Every dollar counts! Donate online at 30 Kids or email Lyle Allen for more information, lyle@careforreal.org. Join us this Saturday for a fun time at Call Bar, 1547 W. Bryn Mawr, for A NIGHT IN THE MAGIC KINGDOM. Seating begins at 9:30pm and proceeds benefit Care for Real. Chicago will become the first U.S. city to offer a municipal ID that all users can use to load and pay public transit fares, under an innovative agreement between the City of Chicago, acting through its Office of the City Clerk (OCC), and CTA that will firmly establish Chicago, CTA and the CPL at the forefront of efforts to make cities more welcoming and inclusive. The Chicago Transit Board on Wednesday approved a partnership between the City and CTA that will integrate Ventra into the city’s municipal ID cards, expected to be issued starting in December 2017. By including a transit card as part of their municipal IDs, Chicago residents can more easily and conveniently access CTA and potentially reduce barriers to riding transit. Municipal IDs will function just like regular Ventra cards, offering the ability to load any Ventra fares/products at vending machines, retailers, online and via the Ventra app. The CTA will provide the City blank Ventra cards on which the city will print the municipal ID cards. The City will reimburse the CTA for the costs of the cards. In addition to connecting the cards with the Ventra, municipal ID cards will also be connected to the Chicago Public Library (CPL). Chicago residents will be able to use the ID card to open an account with CPL or sync new or existing library accounts with the Municipal ID so that the ID can also physically serve as a library card. For the latest updates on what’s happening in the ward, seven days a week, be sure to “like” our Facebook page. Here’s the link! 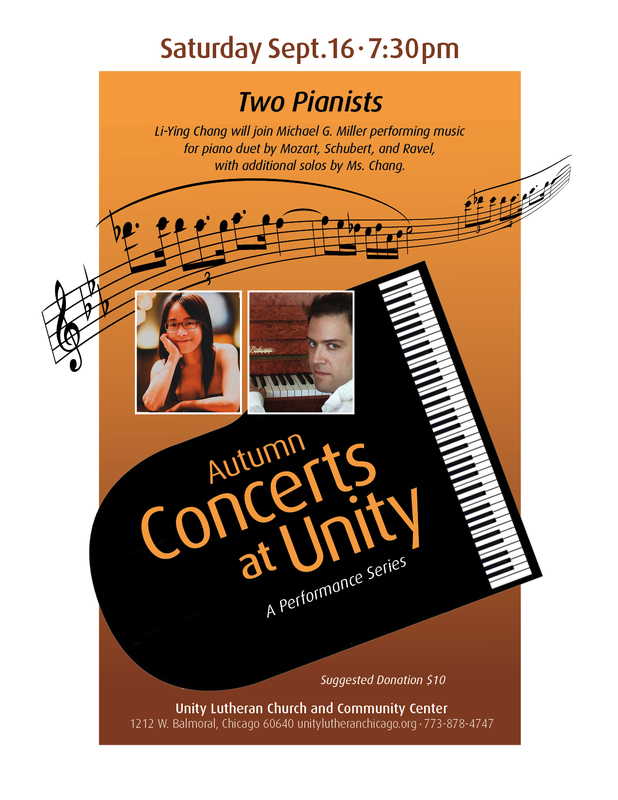 Li-Ying Chang joins Concerts at Unity organizer Michael G. Miller performing duets by Mozart, Schubert, and Ravel, with additional solos by Ms. Chang. Skokie Public Library, 5215 Oakton St. Residents, commuters and other stakeholders are encouraged to attend an open house to learn more about the Pace/CTA North Shore Coordination Plan and share input on the initial recommendations. Click here for more information. Metcalfe Federal Building, 77 W. Jackson Blvd. Every Sunday afternoon, Marty’s opens early to support community organizations through the MARTINI’S THAT MATTER program. Marty’s will donate the profit for the afternoon to St Ita for assistance with the ongoing expense of maintenance for the exterior of the church. We are very excited this is St Ita’s SIXTH year to participate in this event and has benefited with over $3,500 from these events – so come out meet the new Franciscan Friars, St. Ita Parishioners and friends while enjoying an iced cold beverage while the profits benefit St Ita! Gunder Mansion, 6219 N Sheridan Rd. by 5 pm on Wednesdays to be included in the next Friday’s newsletter. Copyright © 2017 Harry Osterman – 48th Ward Alderman, All rights reserved.